I completed the images for the Picatrix Decans in late November of 2017. As I was making the images I knew that one of the things I wanted to do with the collection was to publish them as a deck of cards. There are a few reasons I wanted to do this. First I wanted an affordable way for folks to be able to collect my artwork. But more importantly for the readers of this blog I wanted to produce a way for folks to use the images in magical work. The deck of the Picatrix Decan cards is ultimately a practical tool for the practicing magician. But what does this mean? How can any cards be used as a tool and in particular what are the uses of the Picatrix Decan cards? Let’s explore some of my ideas that may answer this question. Be aware, dear reader, that these are just my ideas and that you may come up with something completely different that suits you better. As the author of these images I feel no need to be strict about their use. The initial use I had in mind as I made these images was that they would be used as talismans and magic charms. A description on the box of cards names it as “a collection of 36 talismans”. Incidentally this is the use for which they are presented in The Picatrix. In order to employ a card for this use one would choose a decan that represents an effect they desire. If one wanted wealth, for instance, one may choose to use the Second Face of Aries as their talisman. Then the magician would choose a time to “wake up” and charge the talisman with the energy of that particular decan based on the astrological conditions. Then they would perform a ceremony to imbue the image on the card with the power of the decan. This can be as simple as telling it to “wake up”, or as elaborate as one wishes with candles and incense and anointing with prepared oil or water. The card itself then becomes a magically charged item that works to bring wealth to itself. If one were to carry the charged card wealth would come to them, if the card were kept at a business wealth would come to the business, and so on. In The Picatrix these talismanic purposes are listed in Book 2, Chapter 11. For those of you who do not own a copy of Greer & Warnock’s The Picatrix, which is the reference I used to make the images, a small pamphlet is included with the deck that paraphrases the descriptions from the book. Once one is finished with the effects of the talisman another ceremony is enacted to discharge or put the image to sleep, so to speak. This is especially important for talismans that are used for destruction or bad luck. There are traditional ceremonies described in The Picatrix that go into detail about how this is done. We will revisit these in another blog post. 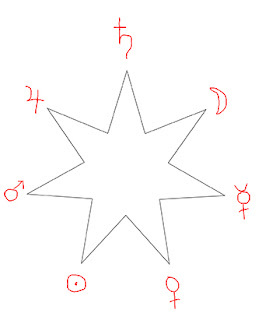 One of the underlying beliefs of the ancient authors of The Picatrix is that the planets and stars of astrology are populated with the intelligences and disembodied spirits that comprise the mythology and are more or less available to communication and interaction. In many ways the concepts of spirit communication and talisman empowerment have some overlapping themes and procedures but they can be kept quite separate. It is a somewhat advanced skill and might be available to a person in varying degrees. It is a notable fact that The Picatrix does not give names to the spirits of the decans. Other traditions do all the way back to the ancient Babylonians. The British Egyptologist E.A.W. Budge gives the names of the decan spirits in his book Gods of the Egyptians, and the 19th century magical lodge The Golden Dawn has its own list. I chose to follow The Picatrix as my guide and have not presented names for the decans. This should not, however, lessen the spiritual dimension to this work. There are many methods one might use to try to communicate with the spirits of the decans that have been passed down from antiquity. The curious reader will have no trouble finding a method that suits them. As a deck of cards the comparison to tarot will be a natural one. Indeed these cards can easily be used as an oracle deck, either in conjunction with or entirely separate from a traditional tarot deck. The diligent student of tarot will be aware that the two most popular decks on the market, the Rider Waite Smith deck and the Crowley Harris Thoth deck, associate the decans to 36 cards of the minor arcana (minus the Aces and the court cards). I did not use these tarot decks as reference in the designs of the images on my Picatrix Decan cards and more often than not the imagery and connotations are disparate. Again, this is due to using The Picatrix itself as the primary source. But this shouldn’t stop one from mixing and matching as one may. On its own the Picatrix Decan cards can be used as a divination tool using the talismanic purpose of the image as the interpretation. For instance, the Second Face of Sagittarius is paraphrased in the included pamphlet as “a man leading cows with a bear and ape in front of him. As a talisman- fear, impediments, blockages”. As an omen or divinatory result one may interpret it as facing one’s fears or that fear blocks their progress. For all of the images I used my intuition in the composition of the pieces. It is my hope that some of these intuitive leaps on my part will add potential divinatory meaning to the cards and spark the intuition of those who read them. One of the benefits to me of doing this project was the deep contemplation and exploration of the images of the decans. It is my sincere hope that these may be used as a reference of sorts and that a student of The Picatrix may read it with my cards by their side. To my knowledge there are no other sets of images of the decans based primarily on The Picatrix, as opposed to Agrippa, Ibn Ezra, or other source. The Picatrix tells us many times in its pages that the passages of the book are written in codes, riddles, and obfuscations. It also tells us the way to discern the hidden messages is through meditation and deep thought. Indeed, I discovered a few philosophical gems in making the project. The most important to me was that I was able to match several of the images to characters from Greek, Hindu, and Arabic mythology. No doubt more secrets may be uncovered through further contemplation. On a personal level I am very proud of this work and its place in my art career. As collectors gather my work the Picatrix Decan cards stand as a novel way to acquire all 36 images at an affordable price. The large, fine art prints are sold in limited editions and soon these cards will be the only way to buy them. Decks are still available on Etsy at https://www.etsy.com/listing/601015785. Friends and Neighbors, I am very excited to announce that the pre-order period is open for copies of the card deck of my 36 Picatrix Decan collage images. Each copy is $36 USD and comes with a little white book of descriptions. Email to moonlithermit@gmail.com to order your copy and to receive more information. Decks will ship on March 15th. I was in an online discussion about Saturn when it came up that people were concerned about becoming depressed if they were to work with Saturn. While Saturn can be difficult to work with he should by no means be avoided. Saturn gets a fearful reputation as the Greater Malific but all the planets have their positive and negative characteristics. What is required is a balance. Here I present something I shared with the group that I realize I have never included in this blog. I put it here for posterity if nothing else. I have not found this idea expressed anywhere else and I think it has some value. In brief, the effects and influence of one planet can be nullified or reduced by accentuating the properties of the two planets on either side in the days of the week, the day before and the day after. To counter Saturn, the magician needs the joyful beauty and hedonism of Venus as well as the warmth and vivifying power of the Sun. To counter the Sun, the magician needs the cold restrictiveness of Saturn as well as the deep watery darkness of the Moon. To counter the Moon, the magician needs the warmth and vivifying power of the Sun as well as the fiery assertiveness and strength of Mars. To counter Mars, the magician needs the deep watery darkness of the Moon as well as the mutability and flexibility of Mercury. To counter Mercury, the magician needs the fiery assertiveness and strength of Mars as well as the law-giving, empire expansiveness of Jupiter. To counter Jupiter, the magician needs the mutability and flexibility of Mercury as well as the joyful beauty and hedonism of Venus. To counter Venus, the magician needs the law-giving, empire expansiveness of Jupiter as well as the cold restrictiveness of Saturn. 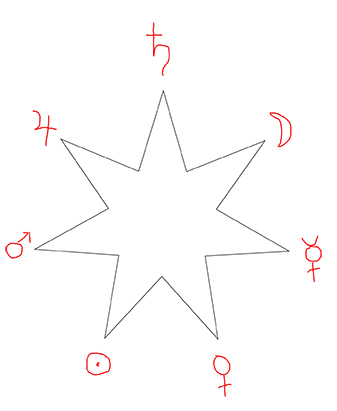 I got the idea for this as I was looking at the glyph of the seven rayed star that represents the Chaldean order and the order of the planets in the week. The influences of the planets are balanced as their influence ebbs and flows though the week. And as I wrote it out is made a lot of logical sense to me. I think that there are many potential applications of this idea in ritual preparation and spirit work.